I will start off by introducing a great company I have come to work with. EDC Depot. I found their site a few years ago and added it to the links section because of the sheer number of great products they provide. Then I went to the PEACE Rendezvous at the Wilderness Learning Center and was suprised to find them setting up a blanket. I immediatly bought a Canadian belt knife (Made By Cold Steel) as I have had my eye on one. I got to talking with them and found them to be really great people. I went back and bought a small neck knife (Meyerco) for my lady and they gave me 3 of these really neat pill cases with their logo on them. Sweet! Anyway after the event I got an E-Mail from Marc and he asked if I would test out some gear he was adding to his inventory if he sent it to me. He told me to not hold back. He sent me the Cold Steel Finn Wolf, the AMK Heatsheet, and the Pro Force Flint and Steel. I got these shortly after and began playing with them. I find it interesting to note that EDC Depot sent me the makings for a basic survival kit. What they sent me would fill the shelter, fire and knife catagorys in a survival kit, add a pack of band aids, some cordage, a small fishing kit and some rations and you have the makings for a great kit.! Anyways, I was most eager to begin working with them and I must say I have very much enjoyed the process! 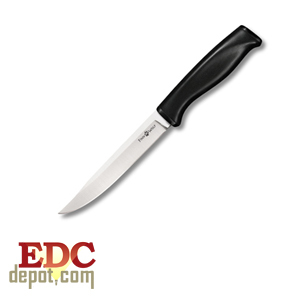 I have used it in the kitchen and for food prep this knife really shines. 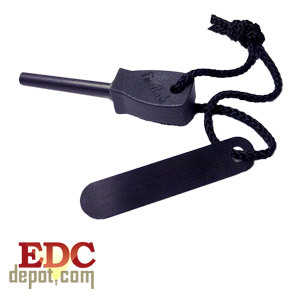 Since the general purpose camping knife is one that needs to do camp kitchen duty well, it goes without saying that this knife would be a very fine choice. In addition, I tryied a basic snare trigger set and it allowed me to work that one up easily! This knife's blade is rather long and thin with an acute point which lends itself well to fine work. on the down side this might make the point prone to breakage but this did not occur during this phase of testing. EDC Depot sent me some very fine equipment to test and one of my favorite items in the package is this little guy. Called the Pro Force Scout Sparker, this swedish fire steel type item is a dream to use! It throws very hot sparks and after just a few good strong strokes I was able to start dry pine neadles up and this lead to a respectable blaze. Usually using a sparking tool like this is quite difficult without added excellerant like PJ soaked cotton balls or similar. This tool is very comfortable to hold and I had no problem keeping ahold of it even with sweaty hands. The striker for this model is quite effective although I would use a bit of duck tape to cover the part you plan to hold onto as the edges are somewhat sharp. While similar to the swedish fire steel I presently have, the Pro Force has some specific differences. The handle, as mentioned before is quite comfortable. While it is not as large as the Light My Fire version, it has a better gripping surface and I think the size has something to do with it. This is a product Im quite familiar with. I have used sheets like this for some time and always reccomend having them in your always with you kit. 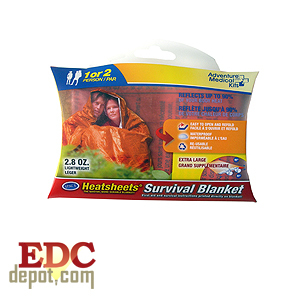 The first thing I noticed about this specific survival blanket is its case. It fits perfectly in the cargo pocket of a pair of BDU Pants. This is a big plus for me! More often than not the ones I have bought in the past are difficult to carry as they are quite large (even in thair original folded state). Upon opening this guy up, I was very suprised at the size of the sheet. It is definatly larger than the standard ones I have worked with before. As a blanket, it works fine as Its basically the same materials of the other blankets I have used. What I was really interested in is the other uses they reccomend on the back. These being as a tent like shelter and a gear cover. I first pitched it with paracord between two trees and it would in fact make a servicable shelter. the down side is that for you to have any amount of room, the shelter would have to be suspended like a tarp shelter would be. While this will keep the rain off, it kinda defeats the perpose of the reflective surfaces as your heat will escape from the sides. However this is fine if you only need shelter from rain and such. As a shelter for gear, well...it will work like a tarp but I would hate to waste this thing on gear..usually if I have gear, I have a tarp...better for me to use it on my body.. The durablility is pretty good for what it is. Im not too confident that it would hold up to long term use but as an emergency measure its head and shoulders above the cheapy Walmart type "survival blankets" In short, this guy fits the bill quite nicely for a person to use. I wouldnt think it would be too effective for two people except when used as depicted on the cover of the container. The Canadian belt knife is much like the Finn Wolf in that the blade is made of the same material and stock size. I have to assume the same heat treat method is employed here as the two blades performed in much the same way in the basic cutting department. The first thing I did with the canadian belt knife was to go through and peal bark off of a few branches for walking sticks. I also used it to cut up veggies for a roast I made at Peace in the dutch oven. This by the way was a splended test as I had also forgotten my lid lifter so I had to make one up on the fly. This was done by taking a robust piece of popler that someone at some point had felled (recently) and carving a crotched end so as to present a hook to loop under the handle of the dutch oven. what came out was not pretty, or overly convenient but in the end it was quite servicable with a little bit of carefull fussing. This carving job was no problem for the Canadian Belt Knife. This knife indexes well in my hand , and its shape lends itself well to a veriety of tasks. Being a modified drop point ( one of my favorite patterns) it has a strong point thin enough for fine work but not so much so that you are too worried about snapping it off. As time goes on, I keep finding I like this knife more and more. Its light, fast and easy to handle. Again it lends itself extremely well to kitchen work and was great for disjointing a chicken and cutting vaggies as well as plitting ribs. The sheath is not really what I expected but is servicable. I may look into a decent leather sheath to replace it but its more out of my love of traditional looks than any real necessity. In its original configuration, you dont even know your carrieing it until you need it and then it comes right to hand without any undue fussing around. Well when the Runner and I have conversations on what gear is the best, we always seem to agree that it is the gear that neither of us own yet. However I have a great light from Rayovak(R), This companys only model of head lamp. It has a white light Krypton bulb, 2 blue LEDs and 1 red LED , I got it from Wal-Mart for about $12. With a name brand battery it will last about 200 hours with the LED and about 3 nights with the white Krypton bulb on. The red LED is nice in camp or moving about, it keeps from blinding your buddy and is still hard to see the red coming. My Moonlight finally bit the dust (after 3 years of abuse! )and I had yet to get a new head lite. I bought another expensive one at a major sporting goods store and RH brought his Rayovac....and my expensive light just didnt stand up. The Red LEDs werent bright enough, there were NO white LEDs on it so I was forced to use the Kripton bulb which blinded RH and ruined my night vision....I was not thrilled. So the next trip we went on, I bought a new Rayovac like RH's. It was a good buy indeed!I must say I am impressed! it truly does live up to what I need in a head lamp. On my last solo, it got nice and wet and still keeps working without a hitch.. I do love the Black Diomand Moonlight but this light has more features....It will be a hard choice between the new Moonlight and this one on my next trip! 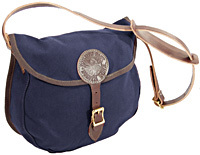 From The Ridge Runner: A couple years ago, I picked up a nice new Shoulder bag, the Duluth Pack Standard Shell Bag. The one I have came in Blue and I really like the way it hangs on me. I have been using various courier bags and a German Bred bag for my Maxi kit and I thought I would like something a little more classy. Well I got a big surprise here, it is very comfortable and the seams are very well stitched. I have used it on and off for the past two years and it has turned out to be a very well put togeather item. I have used it for campine, muzzleloading supplys, work gear and low and behold, a place for shotgun shells! For all of these tasks it stood up and shows little or no wear. My only complaint is that it is not the least bit waterproof..but then its canvas so I wasnt really expecting that. I added some camp dry and stored sensitive items in ditty bags and it worked just fine. The leatherwork is very fine with a nice leather medalion on the front. All in all, a natty bag big enough to hold all the essentials. 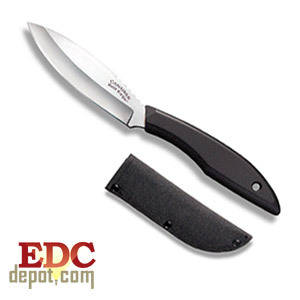 This is the Outdoor Edge "Wedge II"(R) , I picked up this knife at a local sporting goods store and it looks quite promising. It has a longer handle and blade than the Wedge I and seems to be quite rugged. It fills the hand nicely and the sheath seems secure. First impressions of the knife include a good solid feel and is very lightweight . The blade reminds me of the tip of a very fine grade chefs knife and lends itself well to food prep tasks , skinning and cleaning game. The handle seems quite sticky with good control characteristics. The jimping on the top of the blade extends right into the handle material and lends itself well to fine tasks. The edge is fine and is razor sharp. The overall fit and finish of this knife is quite nice although the huge "WEDGEII" etching on the blade detracts from its overall looks. After using this blade for a while I can say it is fine for a camp knife. for survival, it would do in a pinch but the blade is a mite thin for heavy chores. it fillets fish nicely and does bring a squirrel down to its lowest denomination with ease. However, its just not cut out for shelter building. Combine this little knife with a larger knife or a sierra saw and you will have a decent rig for the woods. The brand names , titles and other specific features shown and listed on this page are the property of the companies in which they are derived. They are registered trade marks(R). All rights reserved .